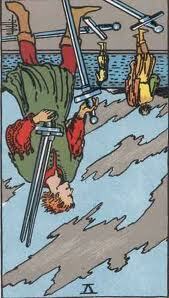 Card for the Day: Five of Swords–Reversed! Fight or walk away? Maybe in the past we have tended to walk away from a particular fight–and walking away from that fight left us feeling like a victim. Maybe it’s time to stop walking away. But that doesn’t necessarily mean a fight is brewing. As Obe Wan said, “You can’t win. But there are alternatives to fighting.” Maybe this is one of those times when we walked away because we couldn’t win–but now we see another way to handle the situation. Something creative. Like, maybe speaking from the heart instead of fighting back. On the other hand, maybe this card tells us that a situation will arise today and we’ll have a choice–fight or walk away–and not too much good will come of either option. Either way, be alert to situations today when you might have to choose to fight or walk away. Consider your options with care and choose the most ethical alternative, if you don’t want to regret your choice later. Previous Card for the Day: The Hierophant–Reversed! Institutions Upside-Down?